Oriens hotel & Residence is a residence hotel only 5 minutes walk from Chungmuro station (subway line 3,4). Located at the heart of Gangbuk area of Seoul, the accommodation is surrounded by shopping center Myeongdong, Chungmuro with its traditional folk village, and the seasonal changes of Namsan. There are 116 guestrooms total with a serene interior. 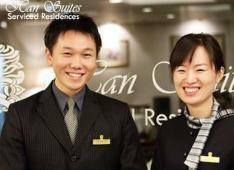 As a residence hotel, all rooms are equipped with kitchen, washer and dryer to accommodate shorterm to longterm guests. There are diverse programs including yoga classes at the fitness center, Korean language classes and movie watching time. Come enjoy the surrounding lush trees and the close proximity to downtown Myeongdong.